Todd Flora’s Americans: Please enjoy this 3rd Edition of “Random Musings,” my stream of consciousness-style posting. These are a series of independent, and sometimes loosely organized, thoughts on my mind of late. Do you ever wonder if the employees and executives at Bed, Bath, & Beyond are just laughing at us? “Ha! These people think they are getting 20 percent off items that we’ve actually marked up an additional 20 percent! Suckers!” … I do. Every. Damn. Time. Also, why are there so many people working there, but none in my immediate vicinity when I have a question? I’m seeing a marked increase in photos of what people can see while in a lounger or with their feet kicked up on a boat or by the pool lately. Is this really about location? Bragging that you’re lounging somewhere warm with an umbrella drink? Or are feet just “really in” right now? “I want to go into teaching to work with firearms,” said no one, ever. “I wanted the direct experience of being a prison guard, but I had to settle for being a teacher,” said … well, maybe a few scary teachers … somewhere. How do I know that Dan and Keith were without a doubt the best broadcast duo in history? Because I don’t need to tell most of you who I’m referring to. A Space Force? … Really? Some space repairmen would by far be more valuable. I want that radio and DirecTV working without fail, mister! … And I don’t even have DirecTV. Pet Peeve: Why do people say, “Desert Island?” As in, “here are the 5 albums / movies / whatever I would want to have on a “desert island.” It’s “DESERTED” island!! Wouldn’t you imagine that most islands to get lost on (including the island ON “Lost”) are quite lush with plenty of greenery? So, please do tell me why we call that a “desert island?” Do me a small favor and call them what they are: Desert-ed islands. Not that tough, people. … and don’t even get me started on less vs. fewer! “Less” is the most incorrectly used word ever. Yes, thank you for asking. I do in fact remain the worldwide leader in the fight against mayonnaise. Ladies, every supposed “man’s-man” who claims he doesn’t like “The Devil Wears Prada” is LYING TO YOU. C’mon. The movie is a classic. No shame in liking it, fellas. I’m going to say it again – I love Dave Grohl. He’s a very talented musician and very funny in interviews. But following years of trying, I think it’s safe to say I will never understand what “good music” the multitudes of fans of Foo Fighters think they are hearing when they are hearing it. I change the station EVERY time. I feel like the Geico Cavemen missed their chance at a hash tag movement. Perhaps #StopPrimitiveShaming could have helped? 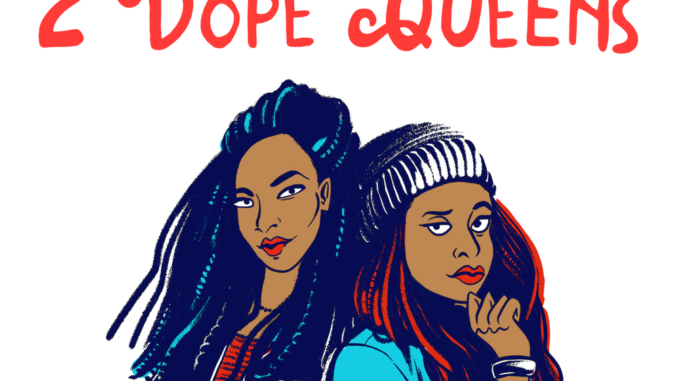 HBO has ordered 4 more “2 Dope Queens” comedy specials. All I have to say is Yaaahhhhhsss. I have 7,076 emails in my Gmail inbox… my wife may be right about my inability to get rid of “stuff.” Is this a form of hording? Or am I just wise to the fact that Google has unlimited Web hosting capacity?